Neil Brand (piano) and Günter Buchwald (violin) playing to Wedding At Belmont Free Church, a home movie of a Sutton wedding party, 24 October 1931, part of the ‘London Loves’ programme of archive film shown in Trafalgar Square, 24 October 2008. 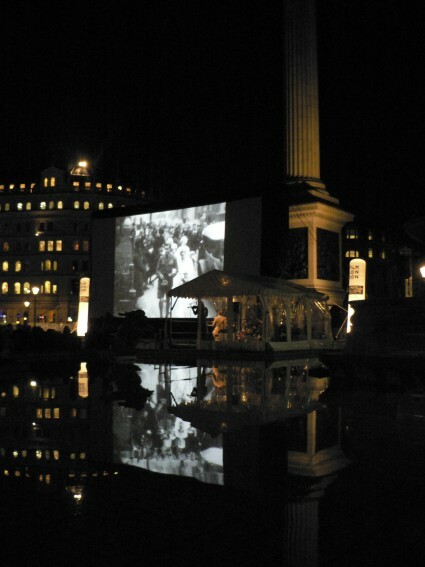 Lovely shot…..I hope the weather was kinder to the films and the audience than the day before, where we (I would guess a good 500) endured rain and high wind for High Treason….was there a good turnout for the London films ?? Incidentally, a low-fi clip of Living London has been placed on the website of The Torygraph…. The High Treason screening was somewhat marred by rain, so it was remarkable that so many turned as did as stuck with it. The inflatable screen waved to and fro in the wind, which did some amusing things to the screened image. London Loves enjoyed better weather, and the Square was packed. Very successful show, with Neil Brand, Gunter Buchwald on violin, and a drummer whose name I forget, sorry. Living London was given the big build up and was the big hit, but… it isn’t Living London. Detectives are still on the case, but it seems that what we’ve actually got are two parts of the four part The Streets of London (yes, I know, Ralph McTell and all that), from 1906. It’s still a Charles Urban film, it’s still a rediscovery, and still a dazzling piece of work, but two years later than was thought. More on this in due course – I only learned of the doubts about its identity yesterday (just as the papers picked up on it and it was anounced to the audience in London…), and I checked the Urban 1906 catalogue afterwards. Sure enough, it matches the catalogue description shot for shot. Heigh ho. Thanks also for the film link – extracts from different parts of the film. Glad someone’s published it. The report features an interview with Ian Christie, who found the film, and who speaks most eloquently on its documentary qualities. I didn’t spot that – I’ll alert those who have access to a complete copy (I don’t) and tell them to look for it. Do you recall what part of the film it was in? London sleeps – London wakes – Early morning in Knightsbridge – The Nursemaid and the Policeman – Regulating the Traffic – Hyde Park Corner – A Coach Meet in Hyde Park – Duke of Wellington’s Monument and Arch as seen from St. George’s Hospital – Constitution Hill – Buckingham Palace – The New Mall – Sparrows and Pigeons in St. James’ Park – Visitors crossing the Bridge – Boys Fishing and Wading in the Lake, St. James’ Park – Guard Mount at St. James’ Palace – The Horse Guards’ Parade Ground, end of Mall – Scenes before the Houses of Parliament – The Embankment from Westminster Bridge – Houses of Parliament from Surrey side – Panorama of the Buildings on Victoria Embankment, including view of Cleopatra’s Needle – Children on steps leading to the Thames throwing their dog into the water to try its swimming capabilities – Incidents at a drinking fountain and trough on the Embankment – Panorama of the Embankment from a Steamer – Passing under Waterloo Bridge – Somerset House – The Naval Reserve Training Ship, H.M.S. Buzzard – London Bridge – Billingsgate – Customs House – Thames Barges and Steamers – The Pool – Distant view of Tower Bridge. 300 feet. The Sandwichman – The Haymarket – The Carlton Hotel and Haymarket Theatre – Pall Mall East – St. Martin’s Church – National Art Gallery – Trafalgar Square – The Nelson Monument – Landseer’s Lions – The Playing Fountains – The Strand – The usual “Streets up,” – Strand Improvements in front of “New Savoy” Hotel Buildings – The Cecil Hotel Entrance – Covent Garden – General Views of the Vegetable and Flower Markets – Arrival of Waggon Loads of Fruits – Sampling Berries, &c., &c. – Covent Garden Market Scenes – Girls and Women Shelling Peas – The Central Hall – The Flower Market – Piano Organ and Street Dancers – The Strand, showing St. Clement Danes’ Church – Another View of the Strand – Fleet Street – St. Paul’s, from Ludgate Circus – Kerbstone Merchants – The Bootblack – Cheapside and Bow Church – Bank of England – “The Old Lady of Threadneedle Street” – Panorama of the “Heart of London” (from the Mansion House) finishing with the Royal Exchange, and the tremendous traffic at this point. 300 feet. As you will recognise, they agree with the film we have, shot for shot. The poster was on a building-end poster site a fair way down on the left, of one of the shots looking down a traffic-filled road. It might only really be spottable on a big screen…I made a note of it at the Verdi. Thanks for the shot list….the film originally began with the old dear asleep on the park bench ???!!!! Good grief….I assumed it was a part-way through, a second or third reel…that must have been pretty shocking at the time, or am I being naive?? I thought it was a shot from mid-reel myself, but it really seems that – aside from a missing opening title (presumably there was one) – the film opened with an elderly woman sleeping on a bench. I doubt that there were any other shots indicating London waking. It would have been an obvious enough concept for the city films of two decades later, but for 1906, there was nothing like it. Would it have shocked at the time? I’m not sure. I think people would have taken it in their stride. But how will we ever know? For the record, this the Urban catalogue description of parts 2 and 3 of the film, the missing sections.